Southern naturalist Ila Hatter displays a Spice Bush, which is used by some to relieve arthritis pain. Dandelion: Contains beta carotene, used by some to improve vision. It is also used as a diuretic and immune booster. Elderberry: Often made into jams or jellies that contain Vitamins A and C and potassium. Sassafras: After roots are boiled and molasses added, it becomes root beer. Sassafras trees also are believed to repel insects. Witch hazel bark: Used for minor inflammations of the skin. (CNN) -- City dwellers may have a hard time imagining how Eric Rudolph, the suspected serial bomber captured in North Carolina, survived for five years living in the woods while fending off a huge federal manhunt. For a culture accustomed to fast food, Internet ordering and overnight mail delivery, the idea of constantly searching for water, food and shelter is difficult to fathom. But survivalists say it's not so tough. "With a little bit of knowledge and the right mind-set, you can lead a pretty comfortable life," said Jim Morris, a former Army Ranger who has taught survival skills. Morris also spent a year and a half "living off the land" in his early 30s on a sort of personal vision quest. "First you get lonely, after awhile you sort of hit a wall and then make peace with your loneliness," he said. "Then you sort of enjoy it." But he said there's a big difference between his situation and that of Rudolph's, who was arrested May 31 after five years on the run. Rudolph, 36, pleaded not guilty to federal charges in connection with the 1998 bombing of a Birmingham clinic that killed an off-duty police officer and seriously wounded a nurse. He is charged with the 1996 bombing of Centennial Olympic Park in Atlanta, Georgia, and the 1997 bombings of a suburban Atlanta women's clinic and a lesbian nightclub in Atlanta. "Eric was being hunted. I wasn't. That would probably wear on a person after a time," said Morris, who is now 45 and a Tennessee sheriff's deputy. Like many people who know and respect the wilderness, Morris first learned hunting and gathering and about natural medicines from a Native American relative. "My grandfather, who was Shawnee, was a shaman, who taught me the old ways," Morris said. And Morris, like Rudolph, learned additional survival skills in the military. In the Army from 1976-1984, Morris was part of an "alert team" trained to work in hostile territory. "We were trained to be like ghosts, living off the land, operating on our own, re-supplying ourselves while we gathered intelligence," he said. "As a Ranger, you're trained to ignore pain, survive in all types of weather and in all sorts of terrain," he said. He would pass along the information he'd gained so that others could put it into a bigger picture. Morris said he's excited about passing on a knowledge of the land to his 3-year-old daughter, Lenowee, whose name in Cherokee means "my precious one." A knowledge of the tools nature provides can help in an emergency, and it's a great self-esteem builder, he said. "If you panic and freak out your chances of surviving are already going down," he said. "You can't despair, you need to think of working your way out." Morris said he also learned a lot about thriving in the woods from Southern naturalist Ila Hatter. Hatter was an only child, born to older parents who wanted to make sure she could always take care of herself. "I grew up hunting and fishing and foraging with my parents. They figured if they didn't live to see me grown, I'd at least have the skills to survive," Hatter said. "I learned to make jackrabbit chili and turtle stew and all kinds of home remedies." Wherever she lived or worked, whether in the Appalachians, Central America or Spain, Hatter learned about the local edible and medicinal plants. Hatter teaches classes of all ages at the Smoky Mountain Field School, part of the University of Tennessee. 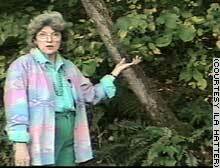 She's also produced videos on "The Wild Edibles and Medicinals of Southern Appalachia." She said the southern Appalachian region is among the richest in the United States in its biodiversity, so someone educated in the uses of native plants could "get by pretty well." Hatter said the Nantahala National Forest in North Carolina, where Rudolph apparently hid out, contains about 500,000 acres, most of it undeveloped. Within the region there are 1,600 flowering plants and 4,000 nonflowering plants, she said. The trick, of course, is knowing what to do with them. Early reports of Eric Rudolph's survival included the information that he had eaten acorns and salamanders. Acorns can be made into a gruel or flour, and the presence of salamanders, spring lizards or crawfish is a good indicator of a clean source of water, Hatter said. With a little seasoning from a sumac tree, a salamander can taste just like sushi, she said. Hatter gives credit to Native Americans for understanding and perfecting the use of plants for everything from toothbrushes and breath fresheners to cures for poison ivy and diarrhea. "When the Europeans came over here they had about 350 formulas for medicines, and the Native Americans already had more than 600," she said. But it takes a lot of energy to live off the land. "That's why most of our ancestors wore out at about age 50," Hatter said.